The cubs have an annual cake auction fundraiser. Each cub decorates his own cake and the other scouts vote for them. 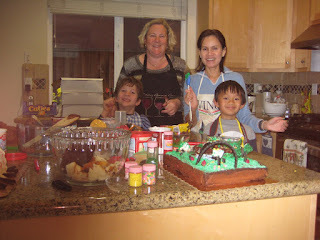 This year, as we have no kitchen, my friend Thuy invited us to her house to decorate the cakes with her and Jody. 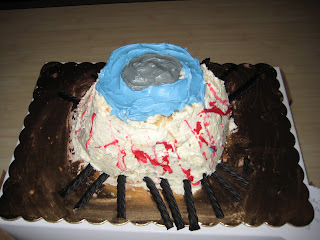 while Fin decided that a giant eyeball would fit the bill perfectly. 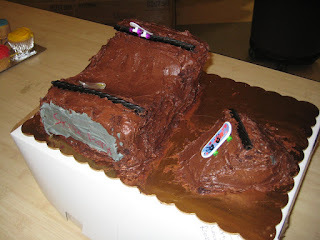 I am glad we didn't have to eat our own cakes this year! Progress has been made both inside and outside. 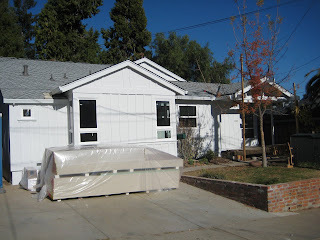 The house passed it's major pre-sheetrock inspection without any major issues. 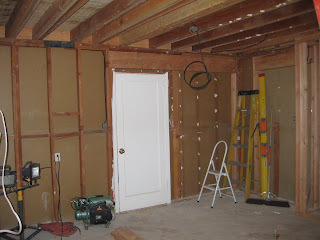 The rough work is all done and sheetrock is about to start. Outside the painting is done and the whole house looks like it's new. decided to stick with the cottagey look of the all-white house. I had to count how many weeks our house project has been going on, it's hard to believe that it's already week thirteen, but so much has happened and it all seems to have been happening so fast. Today there is no one working on the house (they left at lunchtime) and its the first weekday since the project started that we have not had workers here. The outside is essentially finished and we are waiting for the painter to start - to try to get some protection on the walls before the worst of the winter weather starts (hard to believe that it's actually winter looking at this lovely blue sky I know). 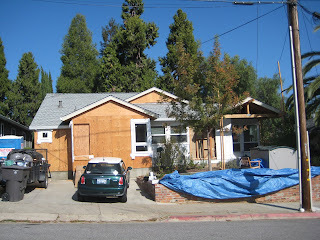 This photo shows the back of the house with the new french windows onto the garden. The little deck/step is built and we are already planning our landscaping. 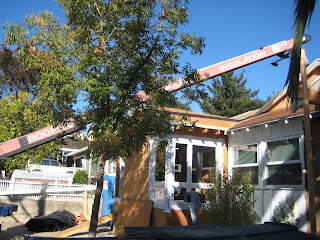 All the windows are installed, rough-in plumbing, electric, and HVAC are complete. We are waiting on some final concrete work before drywall starts. 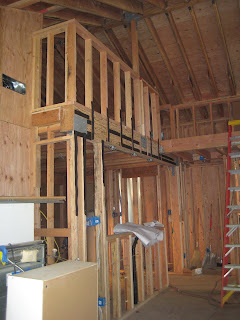 The inside looks a little different: the shear walls are all done, and most of the internal framing. 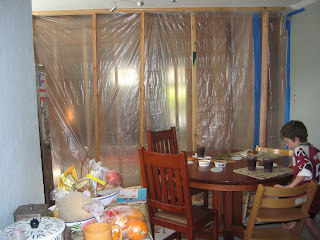 This view shows the breakfast bar and the half-wall around the mezzanine framed out. The water heater has gone from the kitchen into it's final location in the roof. In the foreground are the kitchen cabinets, and appliances. 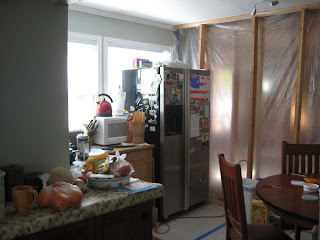 To save some money (and because I still like the kitchen cabinets) we removed our existing kitchen, but are planning to put them back once the kitchen is done. They all had to be removed to accomodate the plumbing/electric, but also to allow the floor to be taken up to access the old foundations for some more concrete reinforcement. I think we are getting to the part of the project where there are a lot of dependencies, and more subcontractors involved (drywall, insulation, painting, flooring etc). I'm hoping that we can keep the timeline on track which would mean we are done by Christmas, but there is so much that could happen before then, that I'm trying not to get too focussed on the date! I learned last week that one of our contractors had a baby since our project started (she is now 8 weeks old!). So naturally, I had to do some baby knitting. 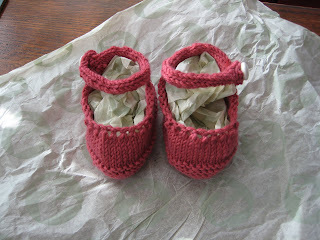 These are Ysolda's Tiny Shoes knitted in Baby Cashmerino. A really nice easy pattern which took about 2 hours knitting with very little finishing required. 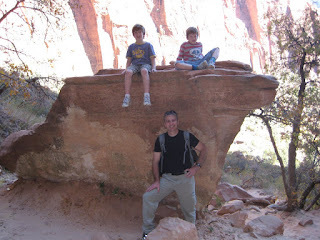 Last week we took the boys out of school for a short mid-term break. (It was conference week so we missed only about 6 hours of school). 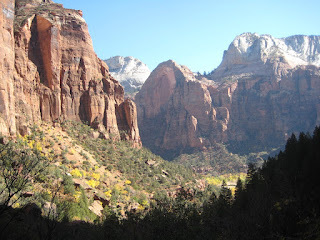 We flew to Las Vegas thanks to Southwest Airlines cheap flights, rented a car, and drove to Zion National Park. 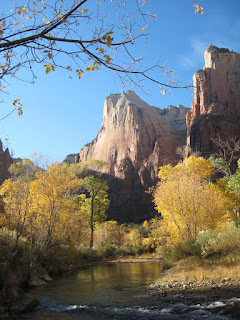 We arrived late in the evening, and when we awoke were greeted by the fabulous red rocks of Zion. We had no plans except to relax and spend time outside. 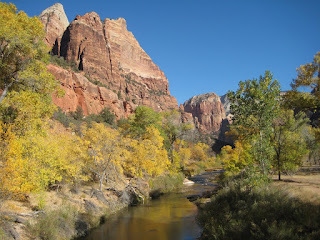 The weather cooperated with 80 degree temperatures and beautiful blue skies. 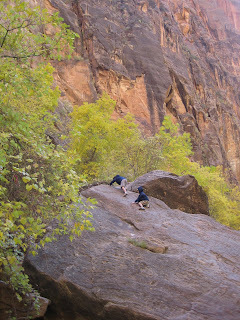 We hiked up to the Emerald Pools on the first day, amazingly without a word of complaint from the boys, maybe because there was plenty of opportunity for climbing and messing about. 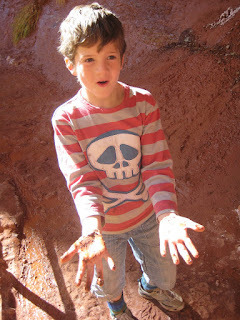 Finlay tested whether the red rocks really did make red mud....they do! In the afternoon we visited Grafton, a ghost town close to the park. The town was the setting for some of the scenes from Butch Cassidy and the Sundance Kid, and comes complete with an old cemetary. The boys were particularly interested to see how many children died young. 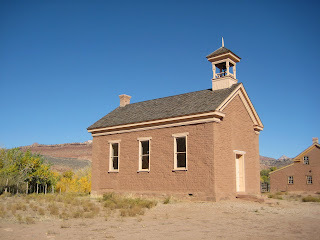 The town was abandoned at the turn of the century but not until they had built a nice school house. The boys remarked how similar the school house was to the one we visited in Columbia. 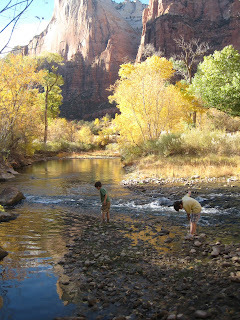 Our second day we spent on the valley floor, walking along the riverside trail, and messing about in the water. 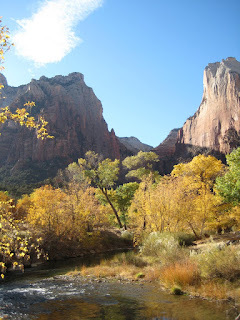 It was a beautiful time to visit the park, not only did we get the lovely effect of late sunshine on the rocks, but we also got to see the colours of the 'quaking' aspens in the valley floor. We had a lovely rejuvenating break which felt like a much longer vacation. We have our fridge and microwave, and of course the kettle. We can use the toaster too, but not at the same time as any other appliance since these are all running off one outlet. Beyond the plastic wall framing is going on for the new wall and it's odd to be eating our breakfast while the team are working inches away from us. 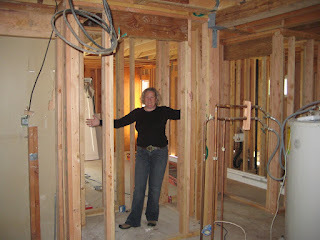 However, it's still exciting to see the new house taking shape - here I am standing in what will be my pantry, and just the prospect of having a pantry at all is great...even if it's just bare studs at the moment. We finally got a new roof this week and it really transforms the house. 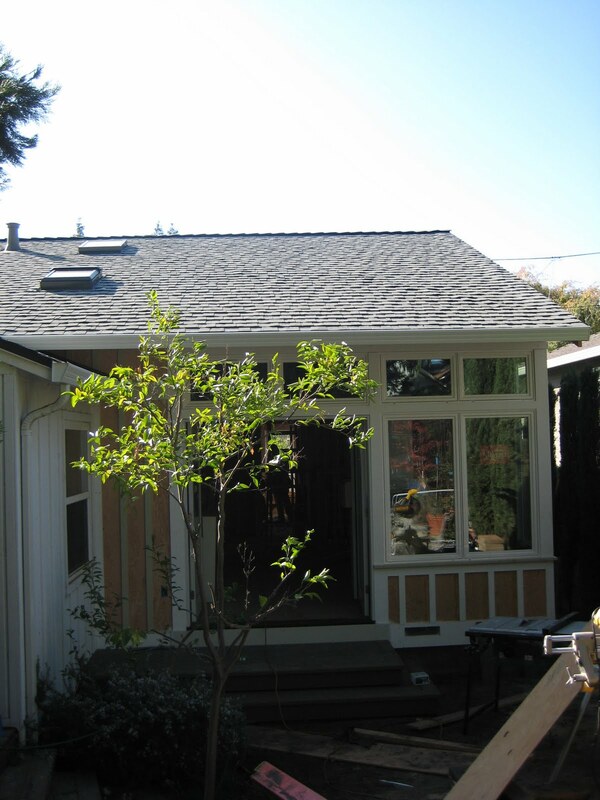 We chose a GAF 50 year roofing shingle in the Birchwood colour. We hope that the light colour will reflect light and result in a cooler house. 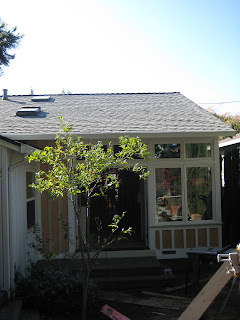 We had also read verious articles indicating that dark roofs contribute to global warming and while this roof is not white, it's the lightest generally available shingle we could find. There are some specific light-reflecting roof shingles on the market, but our roofing contractor told us that they were in such demand that he would not be able to get them before the end of the year. The plywood cladding and roofing shingles are delived to the roof by this conveyer on the back of the delivery truck which is quite impressive to watch. Side note: just after taking this photo I fell into a hole in the garden, one of the perils of living in a building site. Fortunately nothing but my dignity was injured!